It wouldn't be a BEGL release without a new Siren, right? This is probably one of my favorite Sirens so far. I can't help but get excited about a sparkly purple holo. This couldn't have come at a better time. The mix of purple and gold gives me serious Prince vibes. This was almost good in just one coat. I wanted a little more depth so I went with a second one. You're want a good top coat since it dries a little on the matte side. Other than that, there were no issues here. I can't get over how gorgeous this is! It looks like glimmering purple space. I tried to capture the flakies, but it wasn't easy. These pictures are great, but it's way greater in person. 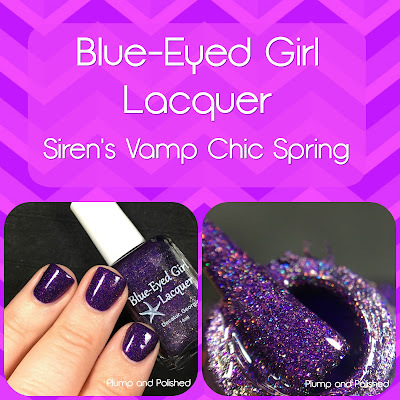 Siren's Vamp Chic Spring will be available April 27 at 3:30 pm est $12.00 USD plus shipping. Siren's Vamp Chic Spring is a numbered limited edition polish. Once it's gone, it's gone!